My sister-in-law Gulay is 34 weeks pregnant with her first baby. The excitement within the family is palpable as this will be the first baby in the immediate family. Even her youngest brother is getting gittery with the impending arrival of his first niece. It’s a wonderful time and we all want to help celebrate. It’s a wonderful feeling to know that in a few weeks time Gulay will be holding her baby, loving her and spending every moment of her life caring and nurturing her. I believe that before entering into Motherhood we should celebrate with women by holding what’s known as a Blessingway. Blessingways are best held between week 36-38. 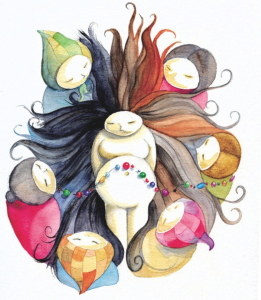 A Blessingway is a very nurturing ceremony that celebrates the mother’s passage into motherhood and prepares her mind, soul and spirit for the birthing process. A Blessingway is different from a baby shower in that it focuses on the femininity and power that comes through growing a baby and giving birth. I haven’t held a Blessingway for sometime, but I know that Gulay, like many women, need extra support, care and love in the final weeks of pregnancy. Women need the reassurance from family and most importantly female friends, and I know that some of the Blessingway rituals are very uplifting and powerful giving love, strength, confidence and belief in her ability of her body to birth her baby and her journey into motherhood. Originally a Blessingway was a Navajo rite intended to attract good fortune by establishing harmony with good spirits. These days Blessingways are known for their joyful celebrations in honor of the journey of a woman into motherhood. They are very similar to a baby shower, however the focus is on the mummy to be and are mother centered. Usually only female friends will be invited to the Blessingway. 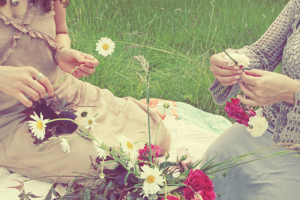 These friends will nurture, pamper and celebrate in a circle. These gatherings can include lots of lovely traditions for the special mummy-to-be. Close friends immerse the mummy-to-be in love, kindness which really get her oxytocin going. Women will talk about their birth experience, share positive birth stories, poems and passages that they feel the Mum to be will take strength and joy from. Here are some idea for your very own Blessingway. Blessingway Belly casting You can buy a belly casting kit and take turns to mould her belly so the mother has a keep sake. These are petty when they are made into a bowl. Blessingway Birthing Beads Ask each woman to bring a pretty bead. 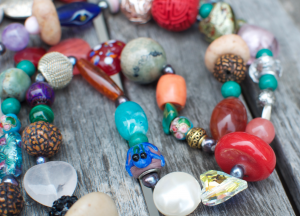 These beads will make a pretty necklace for the mum-to-be which she can wear at her Blessingway and up to the point of her birth. The beads will be thread onto the string and a few small words can be said. Blessingway Bunting By writing positive birth affirmations on fabric triangles they can be hung and displayed in the home ready for the arrival of baby. Blessingway Belly Dancing It’s great if you have someone in the room who knows how to belly dance, as they can choreograph a few moves for the women in the room to join in with, of course you’ll need some lovely music to dance to. Belly dancing at a Blessingway in particular great fun and is very good for pregnant women as it helps relax the pelvic joints ready for labour, as well as strengthening the stomach muscles. Blessingway Candle Ceremony A candle is lit and passed around the Blessingway circle. When the candle is passed the women will say one positive word such as ‘strength” and then the candle is passed to the next woman. Once the candle reaches the Mummy, she blows it out and it can be re-lit by her when she begins her birth. It’s also really beautiful when the Mothers givens them a tea light at the end of her Blessingway for her friends to take away and light once she goes into labour. Blessingway Cord Ceremony A beautiful way of closing the Blessingway ceremony is for women in the circle to help tie some silk thread around each womans wrist. The mother will also have a piece of silk thread tied round her wrist. Everyone in the room will have a strand of silk thread that will be cut once the Blessingways mummy has birthed her baby. Blessingway Henna Belly Painting Blessingway mothers love having their bellies decorated with henna. Common symbols include a Tree of Life or a Mandala. Henna is an ancient form of body art has been used for centuries to adorn those in preparation for rite-of- passage ceremonies.it is believed that henna repels the evil-eye, and wards off malevolent spirits. They are usually applied by a professional henna artist. This is a lovely, baby safe way to pamper and decorate the mum-to-be. 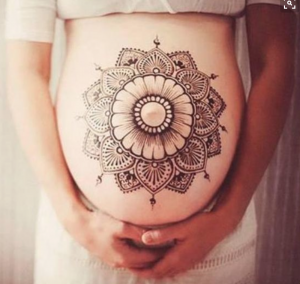 Please ensure you use a pregnancy-safe henna-paste. Blessingway Handmade Flower Crowns Women who are invited to the Blessing way will take a flower that reminds them of the mum-to-be. The flowers gathered will be made into a flower crown and placed on the mothers head. At a certain point women will say which flower they brought and why. Blessingway Quilting I really love this idea. It is especially lovely. Each guest can write a prayer or blessing on a piece of pretty fabric. The fabric can be gathered up after the Blessingway and made into a baby quilt. I always feel it’s lovely for one of the women to take all the fabric and make for the mummy and give to her on the day of her babies birth. Blessingway Wooden bowl It’s really lovely for the mummy to feel connected to all of her friends during her birth as this will give her the strength and focus. By bringing something small natural like a small crystal, a feather, or a rock. 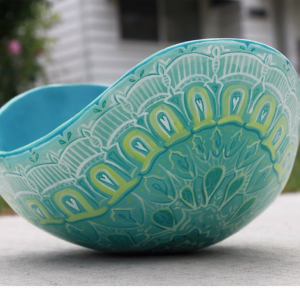 These can be placed in the wooden bowl. At the time of the mothers birth these small gifts will remind her of everyone’s well wishes for her during the birth. 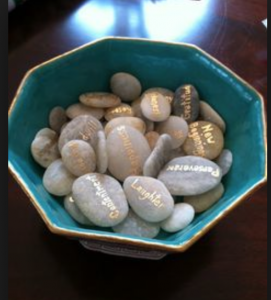 Blessingway Pebble Stones Similar to the wooden bowl but this time each person in the Blessingway circle will write a positive birth word on a pebble and place into the wooden bowl. The mummy-to-be will read these pebbles when she goes into labour.